Prokopovych-Antonsky, Antin [Прокопович-Антонський, Антін; Prokopovyč-Antons'kyj], b 28 January 1762 in Pryluky, d 18 July 1848 in Moscow. Naturalist and pedagogue; full member of the Imperial Russian Academy of Sciences from 1813. 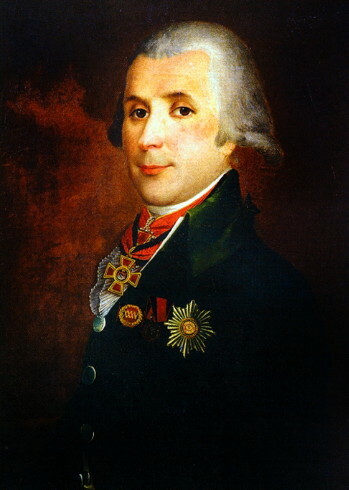 He graduated from the Kyivan Mohyla Academy (1782) and Moscow University (1786) and taught natural science at the Moscow University Boarding School for the Nobility (1787–1802) and then held the chair of agriculture and mineralogy at the university (1804–28). He served as director of the boarding school (1818–24) and was elected rector of the university three times (1818–26). At the same time he presided over the Society of Lovers of Russian Literature at the university and oversaw the first department of the Imperial Moscow Society of Agriculture. He edited a number of journals: Detskie chteniia dlia serdtsa i razuma (1785), Magazin natural'noi istorii, fiziki i khimii (1788–90, a supplement to Moskovskie vedemosti), and Zemledel'cheskii zhurnal (1823–45).